One year Milord gave me some odd-but-lovely fabric for Christmas–about 1 yard of scarlet velveteen with gold scrollwork… in paint. It was beautiful, but not suitable for garments. 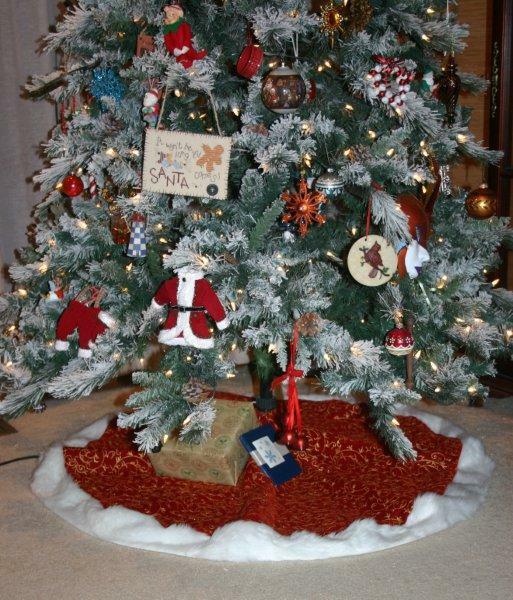 It sat in my stash for a couple of years until it finally spoke up and said, TREE SKIRT! It was perfect. Except it was too small. 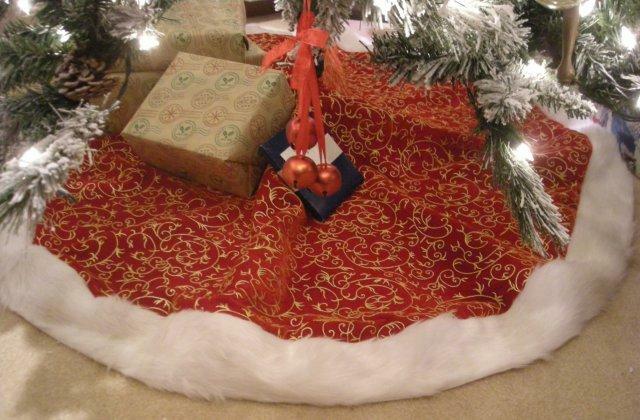 I needed another 4″ or so, so I thrashed around for a border fabric… until I hit on the splendid idea of SANTA FUR!!! Such a quick project–just a circle cut from the velvet, with the outer edge trimmed in 4″ wide fur. No more finishing than that. I bought some pretty rope trim, and some narrower fur for the inner ring… but decided it didn’t need anything else. A motif from Abbey Lane’s “A New Beginning” spot sampler. Another “New Beginning” spot motif. This one is stitched in rayon floss, which is why it’s so shiny. A cute primitive, stitched in linen floss on linen fabric.